Emergencies Do Not Wait for YOU! Do you have a personal emergency plan? Consider where you would go if an emergency strikes your home? A personal emergency plan should have alternate locations in case your home is impacted, emergency phone numbers (cause cell phone batteries will go dead without power to charge), and emergency medical information should you need assistance. 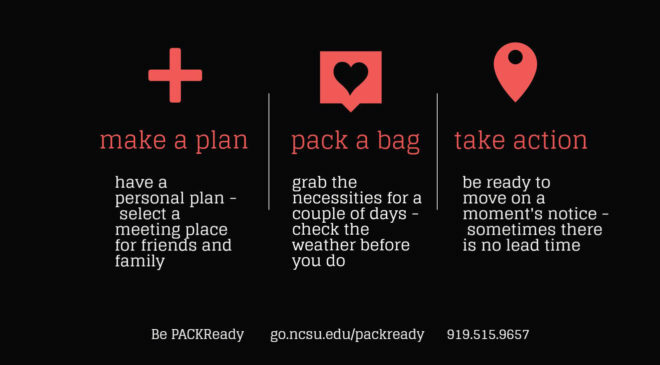 On campus, NC State relies on a variety of plans to support emergency preparedness and operations. EMMC uses an ‘all hazards’ approach to emergency planning which allows for the management of a variety of situations regardless of the cause. With the help of EMMC, departments develop specific plans for their operations and personnel, and review these plans annually. Different events take different actions; review each of the following events to be ready to act! If you cannot leave – stuff towel, clothing etc. under door, over vents etc. to restrict smoke and fumes. Remain calm and obtain as much information as possible using the checklist below. Make note of the caller’s number if caller id is available. Do not handle note any more than necessary; secure it for police officers. If you or someone locates a suspicious device, do not touch. Notify responders. In the event of a hazardous material emergency, building evacuation is necessary. WHEN A SPILL OCCURS, SPECIFIC ACTIONS MAY BE NEEDED FOR SPECIFIC HAZARDOUS MATERIAL SITUATIONS. Avoid being outdoors, especially near trees and water, during a lightning storm. Seek shelter indoors, under shelter or in a hard-topped vehicle until the storm passes. Shelter information for University Housing residents. Alert others on your floor or area.